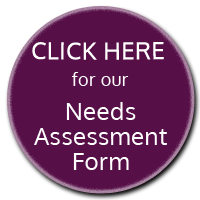 Please fill out our Needs Assessment form and we will get back to you promptly. How many people are in your group/company/organization? Is your group part of a larger group or company? Please explain. Please describe your work environment. Please describe how decisions are made. What issues are you seeing that prompted you to contact us? What steps, if any, have been taken to resolve the issue(s)? How are discipline issues currently addressed? What are you hoping our services will help you accomplish? Is there a time-frame in which our services need to be rendered?